We had a blast at the 2018 Fall Wedding Festival at the TD Convention Center! We absolutely love meeting all the new brides to discuss venue and florals for their wedding day! This year, we decided to update our booth, using a blush and burgundy color scheme. This featured one of our newest Pinterest inspired back-drops, using blush draping and assorted pink and white silk flowers. Another aspect of our booth was our white columns with LED flickering candles. On top of each, we had a bridal bouquet, one Cascading style with pink Roses and white Phalaenopsis Orchids, and the other being Hand-tied Style with a mixture of red Roses, orange Mini Callas, Protea, and a variety of greenery! The brides who came to the booth were able to choose which they liked best to hold for a picture in front of our ceremony back-drop! Our booth wasn’t complete without our wall of hanging gold metallic florals and boxwood wreaths! We also had two new signs for Sapphire Blooms and Events at Sapphire Creek on either side of our booth. In the center of it all, we had our 3-tiered flower cake! It was a beautiful sea of many textures, and realistic silk flowers with the perfect metallic gold cake topper! Not only did we get to decorate our booth, but we were able to make a luscious purple arrangement and some small floral giveaways for My Wedding Group’s booth! Our favorite one-stop shop for brides in need of 5-star vendors!! To finish off the night, Wedding Festival had its traditional fashion show, which featured some beautiful new bridal gowns, bridesmaids dresses, and tuxes! Over-all Wedding Festival gave us the opportunity to get the word out about our new floral brand, Sapphire Blooms, and tell new brides about our lovely venue! Thank you to the 400 brides who attended!! We can’t wait for the Winter shows in January! A big thank you to Dream Shots Photography for shooting our booth and capturing the festivities of the evening! Is there a better way to launch anything than to have a big party to celebrate the occasion? 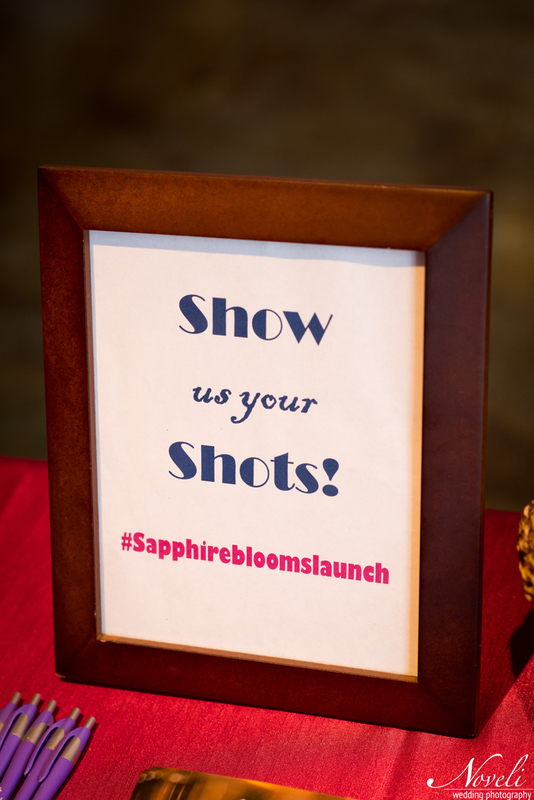 Thursday July 12th, we had our official launch party for our new floral brand at our venue, Events at Sapphire Creek! This unique launch party was characterized by beautiful floral arrangements of various styles in the form of an art gallery! What wonderful wedding is complete without the beautiful flowers that adorn its décor? Weddings are the largest clients for any florist, and we are certainly prepared to put together breathtaking displays for them. This portion of our launch party showcased our tagline beautifully with arrangements as unique as you. Our floral arrangements were split into several different installations with individual styles. The World of Seuss features the uniqueness and childlike inspiration we all got from the timeless Dr. Seuss books. This display was characterized by bright pops of color, many different textures, all around whimsy, and the characters we all know and love! This exhibit focused on metallic accents that are meant to tastefully compliment every event’s unique color scheme, while adding a dramatic affect to a variety of styles! Perfect for every glamorous occasion we had a blast arranging it! This display was an homage to sunsets over mountains and the magic of a single seed producing a mighty oak. These floral pieces centered around the nature that gives us our beautiful flowers we use to create these pieces of art. If you’re a dedicated Pinterest user, you’re very familiar with the Rustic Chic look! This timeless and trendy theme calls us back to remember rich histories and ages past. The versatility showcased in this display shows off the out-of-the-box styles and flavors that are out there! What's a party without games and prizes? We had so many door prizes and raffles, all donated from local Simpsonville business, giving everyone the chance to win! This special event also featured fantastic foods provided by Premiere Party Catering and served tray style! This included mini crab cakes, slow braised rib sliders, and chicken and waffles, as well as, a beautiful fruit and cheese display. 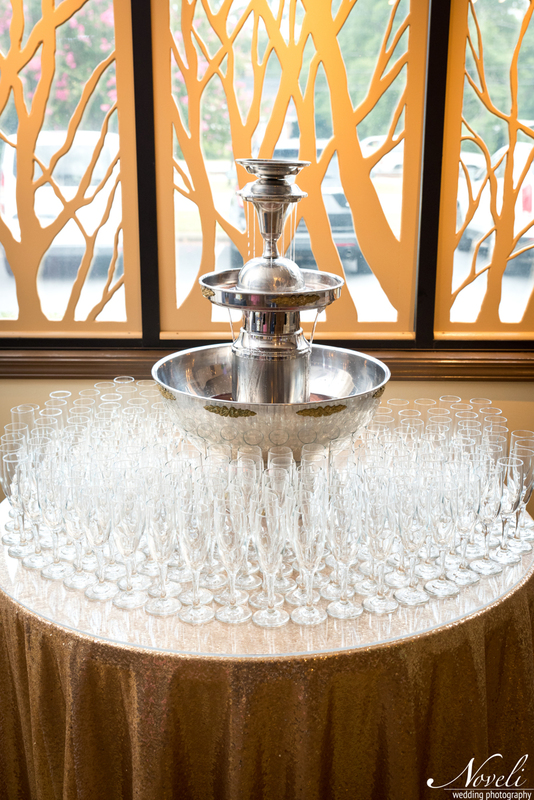 Another stellar feature was our champagne fountain with frozen berries that kept the party going! We even had a popcorn station and candy bar! Delicious desserts were provided by Holly's Cakes LLC in many tasty flavors! For all those who wanted a mouth-watering beverage, we had Blue Groove Coffee Cart in our outside carriage house serving their famous Strawberry Mochas! The party was was a blast with DJ services by Premiere Party Entertainment, who didn't miss a beat throughout the entire event! Dancing was a great portion of this exciting event! Everyone got the chance to enjoy our photo booth featuring fun Dr. Seuss props! The whole evening was captured by wedding photographers Summer and Stephen Gosset of Noveli Photography! Our door greeters generously volunteered from Carolina Bride & Groom, also provided the beautiful wedding gown that was located in our Bridal Glam! All the fresh floral product used was donated by La Hacienda Flowers! This beautiful balloon array was made from complimentary balloons of Burton and burton! It made for an extravagant display that caught everyone's eye! Be sure to show us your shots from the party! Nothing ages quite like true, lasting love, except maybe wine. A lesser known but truly heartwarming ceremony tradition is the wine box love letters. The bride and groom each write love letters to each other and put them in a box with a bottle of wine. Later down the road, when the honeymoon ends, and things start to get more difficult, the couple pulls out the box, sips the wine, and reads those sweet affirming letters to remind each other of the love they felt on their special day. Here at Sapphire Blooms, we were delighted to have the opportunity to design a gorgeous floral arrangement on a beautiful engraved keepsake box for Kevin and Carlye Burbine. Using pure, white flowers to create an arrangement on top of their wine box for the ceremony, we were excited to work on such a different and new arrangement idea. We designed the box to specifically match the style of furniture they have in their home. Another feature of this box, in particular, is that it can also be used as a planter for succulents in the couple's home afterwards, which happens to be Carlye's favorite. Sapphire Blooms is always excited to get to do new, unique, and out-of-the-box custom arrangements for our clients. Why stick with just bouquets and boutonnieres when there’s so much more in the world of weddings to be explored? Marriage is a life changing and wonderful commitment for a lifetime together of love, laughter, and happiness, but it is also a commitment to share struggles, burdens, and hardship. Preparing in such a reaffirming way on the wedding day with sweet letters reminding of all the love and hope a couple shares is a fantastic way to carry the feelings of that special moment throughout a long and happy marriage. A beautiful bride walking down the aisle, make-up perfected, hair done, dress fitted, and a breath taking, beautiful bouquet in her hand…this is the image so many little girls picture when they think of their big day, but what does one really need to consider about that perfect flower arrangement? 1. Color – What colors do you just love? Those colors that, when you see them paired together, just screams at you? Is your wedding bold and dramatic with bright reds, golds, and blues? Or is it soft and romantic with pinks, whites, and yellows? Choosing an eye-catching color scheme can tie together your entire event beautifully, and it begins with the flowers. 2. Flower Choice – Many brides may know the colors that they’re looking for, but is there a type of flower you adore? Doing some research on which flowers will be in season and what kind of flowers you love will make designing a bouquet a breeze. Whether traditional red roses are your style or adorable daisies are for you, knowing which flowers you desire is key. 3. Accents – Who says a bouquet and floral pieces must be just flowers? If you’re a book lover, be creative and have a book pages rose. Maybe crystals are your elegant style and you add crystal or pearl accents. The possibilities are endless when you let your creativity loose. 4. Price – It’s the least favorite thing to think about when planning your special day, but it is an important piece of the puzzle. Do some research on which flowers are more affordable. Go to a florist you trust and trust them to give it to you straight. Depending on your budget, they may have great ideas on how to reduce cost for your special day. I hope you enjoyed our pictures of past bouquets and that this blog helps you to begin your florals endeavor! We are always available to assist you with your floral vision here at Sapphire Blooms! Contact us today to schedule your free consultation. We are eager to help make your florals come to life!